Tiny robots have been helping researchers study how climate change affects biodiversity. Developed by Northeastern University scientist Brian Helmuth, the "robomussels" have the shape, size, and color of actual mussels, with miniature built-in sensors that track temperatures inside the mussel beds. For the past 18 years, every 10 to 15 minutes, Helmuth and a global research team of 48 scientists have used robomussels to track internal body temperature, which is determined by the temperature of the surrounding air or water, and the amount of solar radiation the devices absorb. They place the robots inside mussel beds in oceans around the globe and record temperatures. The researchers have built a database of nearly two decades worth of data enabling scientists to pinpoint areas of unusual warming, intervene to help curb damage to vital marine ecosystems, and develop strategies that could prevent extinction of certain species. Housed at Northeastern's Marine Science Center in Nahant, Massachusetts, this largest-ever database is not only a remarkable way to track the effects of climate change, the findings can also reveal emerging hotspots so policymakers and scientists can step in and relieve stressors such as erosion and water acidification before it's too late. "They look exactly like mussels but they have little green blinking lights in them," says Helmuth. "You basically pluck out a mussel and then glue the device to the rock right inside the mussel bed. They enable us to link our field observations with the physiological impact of global climate change on these ecologically and economically important animals." 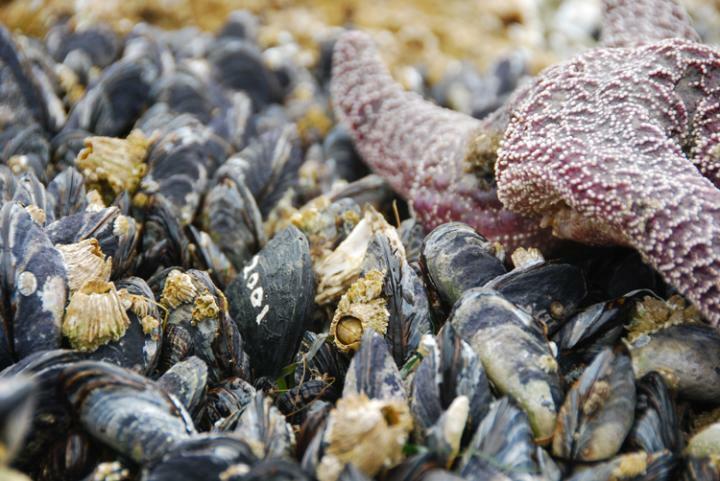 For ecological forecasters such as Helmuth, mussels act as a barometer of climate change. That's because they rely on external sources of heat such as air temperature and sun exposure for their body heat and thrive, or not, depending on those conditions. Using fieldwork along with mathematical and computational models, Helmuth forecasts the patterns of growth, reproduction, and survival of mussels in intertidal zones. Over the years, he and his colleagues have found surprises: "Our expectations of where to look for the effects of climate change in nature are more complex than anticipated," says Helmuth. For example, in an earlier paper in the journal Science, his team found that hotspots existed not only at the southern end of the species' distribution, in this case, southern California; they also existed at sites up north, in Oregon and Washington state. "These datasets tell us when and where to look for the effects of climate change," he says. "Without them we could miss early warning signs of trouble." The robomussels' near-continuous measurements serve as an early warning system. "If we start to see sites where the animals are regularly getting to temperatures that are right below what kills them, we know that any slight increase is likely to send them over the edge, and we can act," says Helmuth. It's not only the mussels that may be pulled back from the brink. The advance notice could inform everything from maintaining the biodiversity of coastal systems to determining the best–and worst–places to locate mussel farms. "Losing mussel beds is essentially like clearing a forest," says Helmuth. "If they go, everything that's living in them will go. They are a major food supply for many species, including lobsters and crabs. They also function as filters along near-shore waters, clearing huge amounts of particulates. So losing them can affect everything from the growth of species we care about because we want to eat them to water clarity to biodiversity of all the tiny animals that live on the insides of the beds."